Perhaps the greatest step toward injury prevention is proper warm-up and stretching. Many people don’t enjoy that part of basketball; they should remember that if they don’t warm-up and stretch well, it may be a long time before they recover from injury and get to enjoy any part of basketball. Stretching well, in addition to preventing injury, is an opportunity for team bonding, conversation and the chance to take turns exercising leadership voices by counting out each stretch. The discipline to stretch well, even when players don’t want to, also serves as a great life lesson in the values of delayed gratification and living out the credo: Proper preparation prevents poor performance. All the players will start and have to stay within half court. One player will be designated as it. The player will run around for the allotted amount of time and try to tag other players. If the player tags someone else, their turn is over. To add an element to the game, if the person has the basketball, they cannot be tagged. So as the tagger approaches a player, whoever has the ball should try to pass it to the player about to be tagged so that they are safe. The ball makes the player safe from being tagged. Mix up the game based on your teams needs (2 taggers, 2 balls etc). Ultimately you want to get the players and their bodies warm and ready to practice in a fun way. Have the players partner up with 2 balls. The first partner will start in a stance on the baseline and will alternate dribbling 2 balls. The other partner will apply pressure and resistance to the dribblers shoulders, hip and the outside of their knees. The dribbler will need to stay in a good strong stance and stay firm against the resistance. Halfway through the elapsed time, the dribbler will change to dribbling at the same time. Then the partner will get in front of them and put two hands on their shoulders to resist them as they drive and dribble forward. After the allotted time, the partners will switch and repeat the process. All the players should have a ball (or share) and find space on the court. 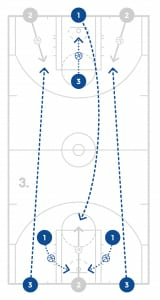 On the coaches command, the players will begin dribbling in the sequence of between, cross, behind. If the player makes a mistake during that process, they will start over with between. 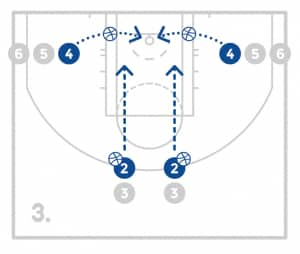 If they complete 3 consecutive dribbles of between, cross, behind, they will count that as 1 rep. The players will continue this process and get as many reps as possible in the allotted amount of time. It will help the players to say the sequence as they go so they complete the reps in the correct order. Challenge the players to move quickly and beat previous scores. 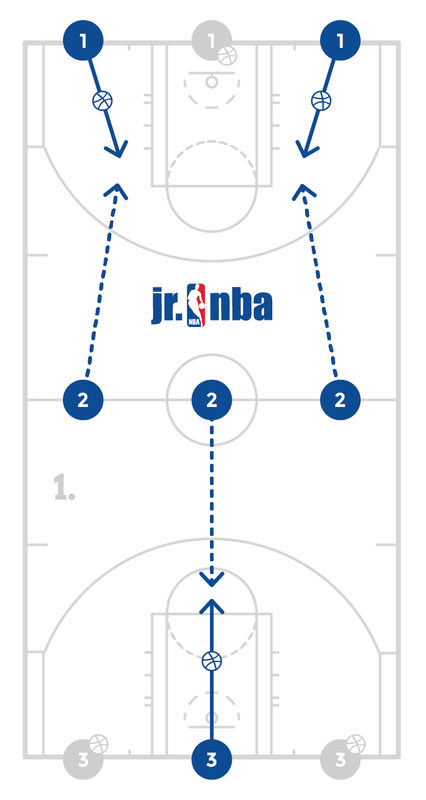 For this drill, have the players get in groups of 3 with 1 ball and start at the center of half court. One player will take the ball and be offense and the other two will become defense and stand just above the 3 point line. The offensive player will be allowed 10 seconds to make a move to get a shot off against two defenders. After the possession, the next group will come on and repeat the process. The group of three will rotate every possession so that a new offensive player gets a turn for the allotted amount of turns. Teach the players some keys such as attacking a weaker defender, splitting if the defenders allow space, and creating space. In this drill there will be two teams of five and one ball. The team that starts on offense will be allowed no dribbles and no screens but must past the ball from player to player without taking a shot. They must count every pass as the attempt to reach 50 passes to win. If the defensive team gets a steal, a turnover or a deflection, it will immediately be their ball and they will start passing and counting their passes. 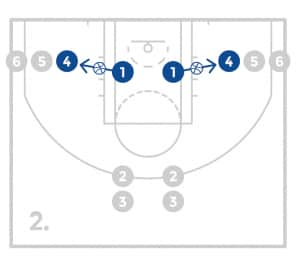 When the possessions change, the offense will start counting from the number they left off on before their last change of possession. So if a team has 12 passes and then turn it over, the next time the get the ball back, they will start with 12 and build from there. This game allows the defense to really pressure the ball and aggressively seek turnovers so it’s important for the offense to be strong and make good passes under pressure. Have the players get in multiple lines at a basket with the first 1-2 players having a ball. The first player in line will make and in and out crossover, shoot the ball, get their rebound and pass to the next in line who will repeat. Remember to work in both directions and keep a score to make it competitive. A minimum of 9 players are needed to execute this drill. 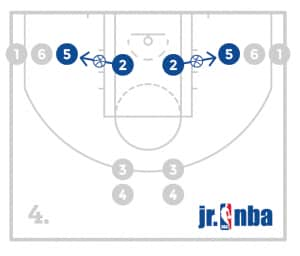 Divide the players into 3 groups, 1 group will line up on the baseline on 1 side of the court, another group will line up on the baseline in the middle of the court, and the 3rd group will line up on the baseline on the other side of the court. Place 1 player from each line on the opposite baseline with a ball. 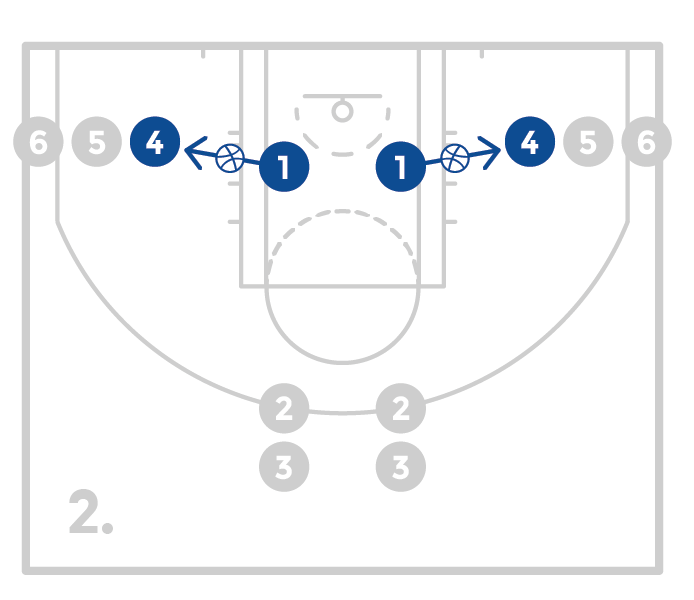 Place 1 player from each line at half court. And make sure the first person on the baseline has a ball. 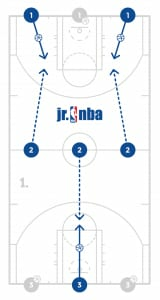 The player at half court will run towards the line on one of the baselines. The player with the ball on the baseline will pass the ball to the player who will catch and shoot. After shooting, the player will get the rebound and go to the back of the line. After passing, the player will run all the way towards the other baseline and catch a pass from the opposite baseline and shoot. After the shot, the player will get their rebound and get ready to be a passer from that baseline. 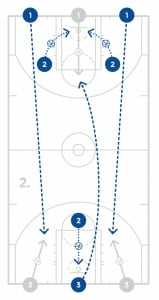 Following the pass, the player will sprint to the opposite end to catch and shoot. The rule is, pass and run the length of the floor to catch and shoot. The coaches can mix up the type of shots. After a team makes the dictated amount of shots, the teams can rotate spots on the court. 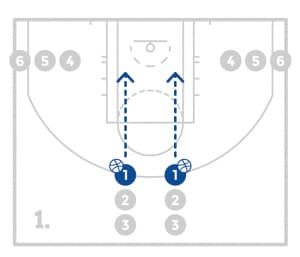 Place 4 lines on the perimeter inside the three point line and one line on the baseline for the post position. Have the first player in each line become a defender and the next player step in as offense. The coach will or pass the ball to make sure the defenders adjust to where the ball is and they will pass back to coach. After a short period, the coach will shoot the ball. The defenders will box out, or tag and pursue the ball. If the offense gets the rebound they can try to score. Following the possession, the defensive team will stay on defense again and a new offensive team will come on. If the defensive team gets the rebound, they will reset and a new offensive group will rotate on. The defensive group must get 5 consecutive rebounds before rotating off. After 5 consecutive rebounds, that group will rotate out and another group will move into the defensive/rebounding role. Have one player start at the top of the key with a ball and another starting in the short corner on the same side. Have 1 defender starting at the block who must guard both players. The player with the ball at the top can either shoot a lay-up or pass the ball. If they pass the ball, the player in the short corner must then catch and shoot. If the player in the short corner gets the ball, the defensive player is working on their contest. 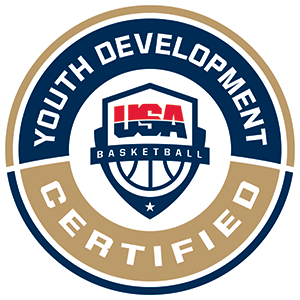 Work on the offensive players making good decisions and the defensive player defending both and contesting shots with a hand up. Have one line at the top of the key with a ball and another line at the short corner. 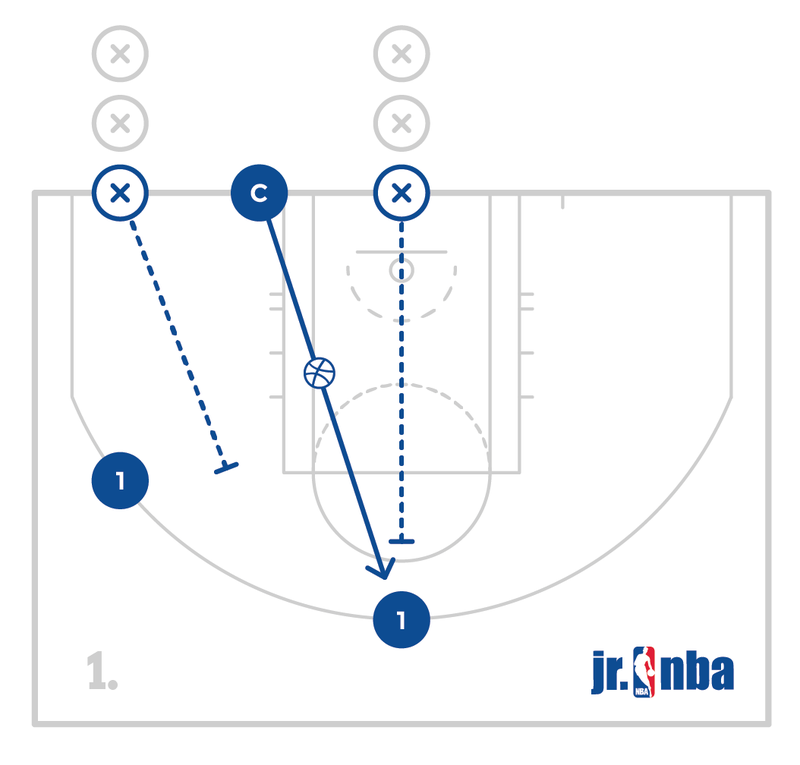 Have the player at the top dribble the ball down the middle of the paint with the ball in the hand that is on the same side as the other line. As the player gets close to the basket, they will jump stop and pass (kick) the ball to their teammate in the short corner to catch and shoot. The players will get the rebound and switch lines. There will be another group doing the same action on the other side of the paint and short corner. These two groups will compete. Make sure the players dribbling into paint with the thought of scoring and coming to a good jump stop. Players should make a good chest pass to the player who is ready to catch the pass with their hands up and knees bent ready to shoot. Place tape down on the court for the teams offensive spots (maybe it’s 3 around 2, 4 around 1 or 5 out). The players will pass and cut and fill the open spots but will always have someone on all 5 spots. After a designated period the coach will tell the team to get a shot and they will shoot and the next group will come on and repeat the process. This allows coaches to emphasize their key spots in the offense and allow the players to become accustomed to the spots and proper spacing between the spots. Have a player on the wing and the top of the key and 2 lines on the baseline lined up across from them. 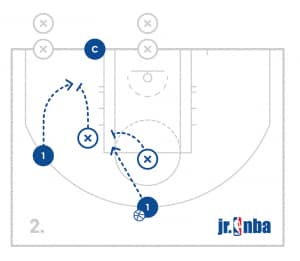 When the coach passes the ball to one of the players on the perimeter, the first two players on the baseline will closeout to the ball or help defense, and then begin playing 2 on 2. Each team gets 1 shot. The offensive team will go off and the defensive team will become offense as the next team on the baseline will execute the next closeout. Make sure the players work on good closeouts and playing good defense. Have a player on both wings and the top of the key and 3 lines on the baseline lined up across from them. 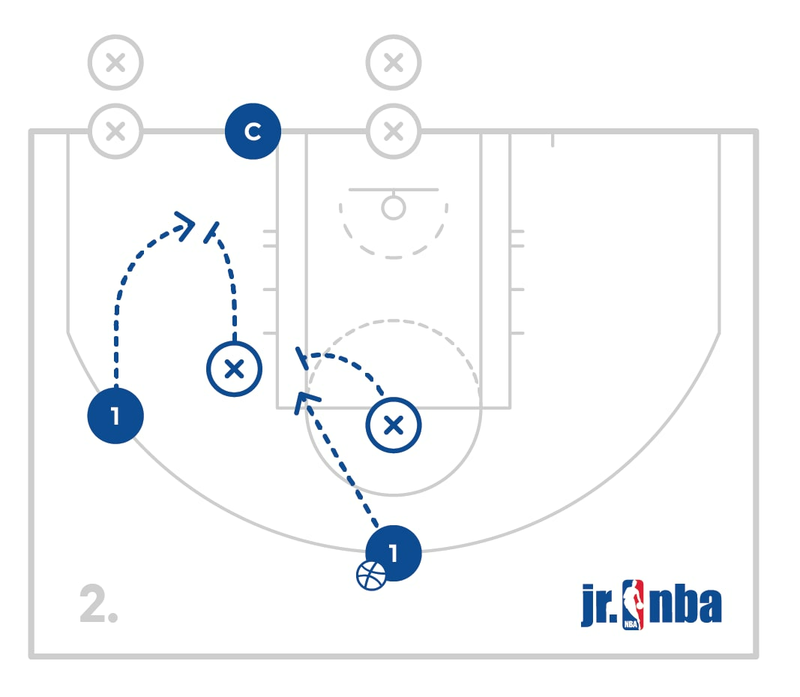 When the coach passes the ball to one of the players on the perimeter, the first 3 players on the baseline will close out to the ball and then begin playing 3 on 3. Divide the players into balanced teams and play 5 on 5. In this game the players will be responsible for matching up and guarding each other full court. The coach needs to emphasize full court pressure while also have the other players to the line of the ball.